Following the events of Fast and Furious 6 (as well as Tokyo Drift) Owen Shaw’s brother, Deckard (Jason Statham), seeks revenge on Dominic Toretto (Vin Diesel) and his crew. The gang teams up with a government agent (Kurt Russell), and a young computer hacker named Ramsey (Nathalie Emmanuel), to retrieve a device that will help them take down Deckard, as well as a terrorist (Djimon Honsou) hunting Ramsey. Furious 7 is easily the best in its franchise. Director James Wan brings the stakes up and does a fantastic job with the action and the cinematography. The film is very exciting, and the sound and effects make the action more thrilling. The cast all do an excellent job, and the script made me laugh at parts. Everything plays out perfectly, besides the fact that Jason Statham isn’t such a strong villain. The ending is sad, and a brilliant sendoff to Paul Walker, who was killed in an accident on November 30, 2013. I really hope they don’t make any of these films without him, he is part of the heart of the franchise and I can’t imagine this series without him. I’m glad this movie had as much heart as it did, which is one of the reasons it’s better than its previous installments. 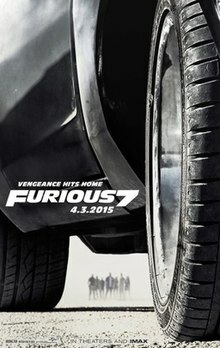 Overall, Furious 7 takes the series up a notch with exciting action, humor, and a touching cast. I would recommend this film if you want to get to the movies to simply have a ton of fun! This entry was posted in Action and tagged dwayne johnson, fast and furious, furious 7, paul walker, vin diesel. Bookmark the permalink.